The 2013 National Board of Review Awards Gala in New York City (January 8th, 2013) saw the ever stylish Anne Hathaway sporting her short hairstyle (a result of her role in Les Miserables). The asymmetrical pixie cut tapers with razor texturing along the perimeter. 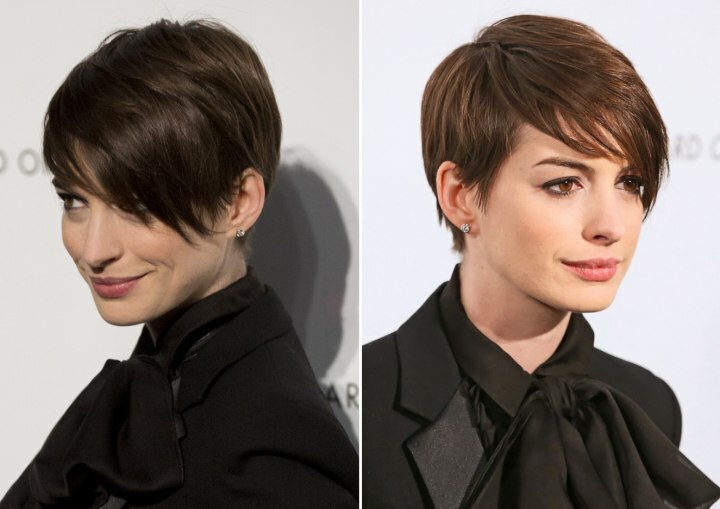 The length of the top section is swept across the forehead and rests on the left cheek, adding a touch of emotion to the whimsy of a pixie cut. Her make-up is truly neutral in color and soft in application. The result is a fresh-faced beauty that is perfect for the girl-next-door. Her ensemble consists of a black tailored tuxedo jacket and pant over a black silk blouse with a romantic collar and lace cuffs falling over the hands. Diamond studs, a patent leather clutch, and simple black sandals complete a class act.